Desaln8 is an Australian owned company with people on the ground in Melbourne, Adelaide and Perth. We are dedicated to providing specific water supply solutions at an affordable price to people and organizations with poor quality water resources. Our core products and services are centred on our unique In Situ Desalination technology which extracts high quality water from poor quality groundwater. This process essentially creates a water resource where none previously existed. This literally creates a new valuable water resource and simultaneously increases the productive capacity of the land. We have leading hydrogeologists, geochemists and engineers on our team to assess your water supply resources and needs. Where suitable conditions apply we can develop solutions using our unique In Situ Desalination (ISD) technology as the basis for a water supply management plan. Water is now an input cost. But by adding precious water to your farm, your business or your community you can cost effectively increase the abundance of crops, production and income. Our team is dedicated to the continuous development of the ISD and related technologies so as to extend the range and scope of applications and solutions to our customers. 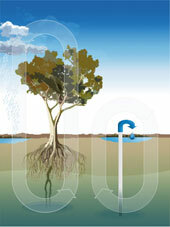 ISD imitates the natural hydrological cycle in the tree pump in a simple way to produce water on demand. Desaln8’s ISD technology has gone through a number of development stages. Find out more about the R&D and innovation process. With key information about Desaln8 and ISD.